100+ RECIPES FOR BATCH COOKING • FREEZING • SAVING • STORING • AND MORE! You know those crazy days when you get home and need dinner on the table 10 minutes ago? Or when your relatives pop in for dinner with just an hour’s notice? Or when you don’t have one more minute to make another dish for a big holiday dinner? The food experts in the Canadian Living Test Kitchen know that feeling, too. That’s why they’ve gathered their favourite make-ahead, freeze-ahead and batch-cooking recipes in this new essential cookbook. More than 100 Tested-Till-Perfect recipes cover all kinds of dishes and all kinds of situations, from easy weeknight meals to big-batch recipes that are excellent for entertaining. There are plenty of surprises along the way, from creamy freeze-ahead mashed potatoes that taste like you just whipped them up to a gorgeous cake you can pull out of the freezer at the last second for an impromptu dessert. 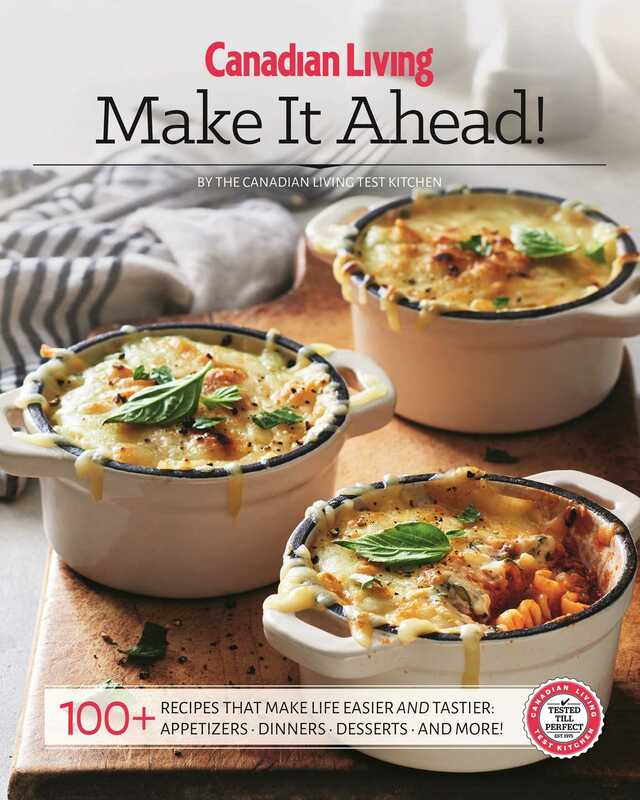 Canada’s most-trusted food experts also share their best tips and strategies for prepping ahead and setting yourself up for low-effort success later on. They’ve included info on choosing the right storage containers, protecting your homemade dishes from freezer burn and much more. • 7 recipe categories, each focused on a different type of dish: Appetizers, Soups and Stews, Meat and poultry dishes, Baked dishes and casseroles, Sauces, Baked treats and Desserts. Book Cover Image (jpg): Make it Ahead !